Titivilus Press /’tı tı ,vı lǝs pr ɛs/ Proper name. 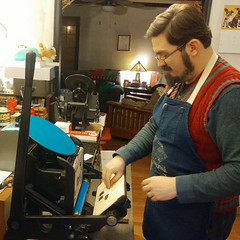 The small press/hobby press of Michael & Tia Hurley in Memphis, Tennessee. 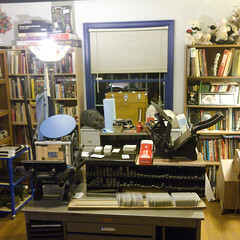 Specializes in letterpress, but includes many other aspects of the printing trade. Titivillus /’tı tı ,vı lǝs/ Proper name. Given by medieval monks to the demon tasked by Satan with seducing scribes into commiting blasphemous written errors in the holy books they copied. Thought by some to be the source of the pejorative “Printer’s Devil,” used to describe the apprentices to a Master Printer. Michael is a professional graphic designer and design director in the printing trade who enjoys mucking about with obsolete printing equipment on the side. He is as skilled in hand-setting layouts from his archive of metal type and “cuts” as he is designing digital layouts in Illustrator or InDesign; which is to say, not incredibly great at either. But it’s still loads of fun either way! 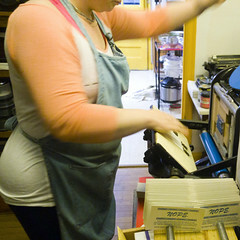 Tia works with Michael in the printing trade as paper wrangler and production management, and enjoys making all kinds of things with her hands including letterpress prints and felt ornaments. She’s also a damn fine baker. Please feel free to contact us with the form below. Thank you! Printing a new round of our NOPE cards. We'll be selling these at #MidSouthCon March 16th and 17th, along with all our other ridiculous and inappropriate cards and prints. If you're in the Memphis area feel free to stop by, geek out, and buy a few prints! Sorry for the double-posts. I meant to add this one with the previous picture. Oops.